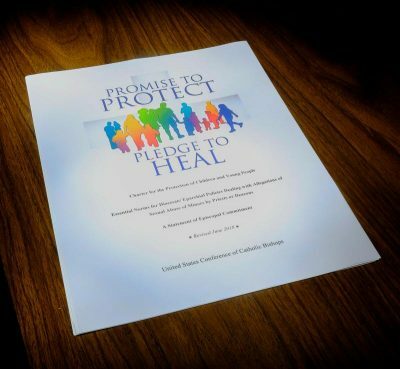 WASHINGTON (CNS) — Surveys show that many Catholics are unaware of the steps that the bishops have taken since 2002 to prevent child abuse and to monitor its own performance. The charter, which is revised regularly, spells out strict procedures for removing from ministry those credibly accused of abusing minors. It also called for training children and all adults who work with them in church and school settings to recognize and appropriately handle possible sexual abuse, and created diocesan and national mechanisms for monitoring compliance. The charter mandated the creation of the Office (now Secretariat) of Child and Youth Protection, which assists office assists “in the consistent application of principles” adopted by the charter and provides “a vehicle of accountability and assistance” to dioceses and eparchies. In 2002, the bishops also established the lay-run National Review Board to monitor implementation of the charter. Francesco Cesareo has been the board’s chairman since 2013. He is president of Assumption College in Worcester, Massachusetts. The full text of the U.S. bishops charter can be found in English and Spanish.